Furnace Removals are not for the faint of heart. They are typically extremely heavy and usually need to be raised out of bulkheads or carried upstairs out of basements. This is a dangerous task and someone seeking help to have them removed should really consider going with a reputable removal company like us. 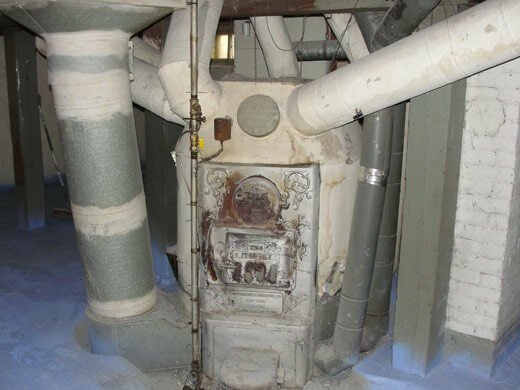 There is a lot at risk when lifting a 400 pound at the minimum furnace up a flight of stairs and crew members can get injured if they do not know what they are doing. This can spell big trouble for a home owner if the "company" doing the removal does not have the proper insurance. Trash Can Willys specializes in furnace removals coming out of basements. Our personnel are well trained and equipped to handle any furnace removal with grace and efficiency. We have successfully removed now over 136 heavy furnaces from customers basements during the course of 8 years in business. We carry all needed insurances so our crew and your home are covered if something should go wrong. Out of 130+ furnace removals we have had one accident, a chipped stair. Thats a pretty good record. You can have peace of mind when having Trash Can Willys handle your furnace removal. Why Not Book An Onsite Estimate!